What happens to fork lightning when it hits the ground ? Does the charge/electron movement carry on all the way to the centre of the Earth. thats why you can earth yourself in the ground. Leo, this is all wrong mate, too busy to explain but it's a bit like chucking a cup of water in the sea, it mostly stays where it is dumped but it does spread out a bit. The ground is definitely not an insulator, as you would find if you touched a faulted electrical appliance while standing on the ground. I suppose the electrons from the lightning bolt would distribute themselves so as to minimize the potential difference due to the induced charge from the storm cloud. The cloud is negatively charged at its bottom which induces a positive charge on the earth's surface. The electrical discharge will tend to reduce this potential difference so the cloud will be less negative and the earth less positive in the area near the cloud. I think the electrons would stay pretty close to the area under the cloud. ground wasnt specific but i think earth is an insulator. isn't that why some buildings have electrical wires which run into the earth so they don't get hit by lightning. NO you are wrong, these cables encourage lightning to strike but in a place where strikes can be controlled and travel past the building and safely to earth. 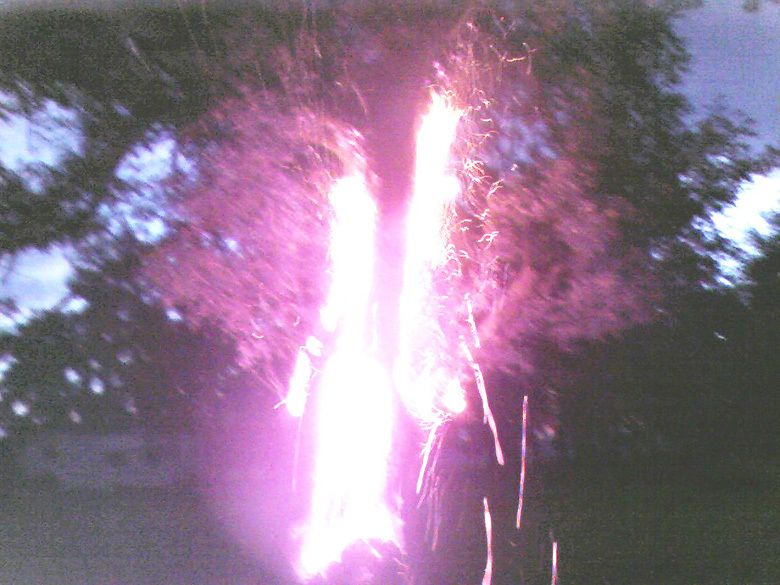 A tree struck by lightning can be split in half or burst into flames, so can a building with out a lightning conductor. strikes an old building the current may travel through old wet walls, if this is so then this water instantly boils causing pressure high enough to blow walls apart (or trees if their centre is moist through rot. Lightning struck trees often have large areas of bark blown away through the sap boiling. The earth does conduct electricity, the fact that lightning can pass into it is clear proof of it! Look up lightning on wiki it has some good articles. CLick on that it is thought to be the only genuine close up picture of lightning striking a tree (I don't think the squirrel made it!). I think you're confused about what an insulator is. An insulator is something through which electricity will not flow. Earthing and lightning rods work on the principle that the earth is very conductive and offers the path of least resistance to flow. If it was an insulator, a lightning rod would be useless. i wonder why i always considered earth to be an insulating material, it seems obvious now that it cant othrwise why would trees and stuff get burned. perhaps it is to do with learning plugs when i was young, earth was there for safety so i assumed earth stopped the electricity. If the lightning strikes sand it may fuse the sand and form a branching fused mass called a fulgerite. Well, I have read of this (somewhere i dont know), but the only thing that can really go to the center of the earth and beyond are neutrinos, because they are so small. I doubt that, even if the earth was not a good insulator, that the energy would go in a certain direction without "dissipating" into the surrounding rock. That is, per say, all the material in the earth is a great conductor of electricity.